You can't keep a good horse down - and that was plain for all to see at Thirsk a few days ago. Roaring Rory was very slow away over five furlongs at thirsk the other day after 220 days off the track, but managed to pass all but two horses on his first run back this season. It was an emotional run for shareholders - some of whom have been involved in Rory's career right from when he was a yearling. The gelding got a great ride from apprentice Oakley Brown - remember the name, he's impressive from a number of perspectives - who didn't panic when Rory was very slow away from the stalls. His young pilot allowed Rory to find his pitch through the first two furlongs and then the five-year-old took off! Rory passed horse after horse through the last three furlongs, despite getting squeezed for room, and hit the line still making up ground. Given this super gelding (who has already won five times to date) was very poorly indeed when fighting off an insidious infection in February, to see him finish with all his flags flying on his opening run of the season was truly breathtaking. He received a bigger welcome into the winners enclosure than the actual winner of the race! A great day at the races. 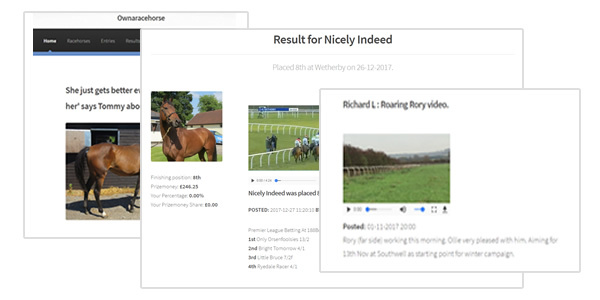 You can watch the replay of the race below - look out for the Ownaracehorse blue and yellow colours! Find a horse for you!